Comment: I found a description of the mining operation on I-Rocks website by the miner, Mike New of Top Gem Minerals. His write up follows. The new zones were not large. It is a weird thing, but, most times, the best material comes at the front end of production. In this case, the opposite was true. The adits were already in place - I did not create them. I wouldn't do that kind of sloppy, unsafe work. The zone ( not pockets ) is a chimney that rises about 200 meters, with a diameter of 2 to 10 feet. Over the years, we have had material from all four different levels as the mining went deeper in search of fluorite ore. There is still some fluorite to be had as ore but not enough to interest anyone in opening the mine again. It hadn't worked for two or three years until I leased it for a short-term, small scale project. This creedite forms at the expense of the fluorite. That is why one can find, on some few specimens, fluorite chips and shards attached to the creedite. The shards came from the movement in the chimney area which broke the rhyolite wall rock and turned the massive fluorite into shards. The creedite was deposited at this time by hot water solutions. The term "breccia pipe" would be an accurate description of this area. The creedite specimens float in a sea of clay. Depending on the character of the clay, the creedite can be dull or shiny, pale or dark orange, small or large crystals. There have actually been a few black creedite balls. I assume the colorant is manganese oxide of some sort. The matrix material is the rhyolite country rock, which appears as small to very large "horses" in the chimney. When work proceeds in the clay surrounding these horses, then cave-ins are a possibility and we had two. The first was minor other than two of our people were buried for a short period of time. The second cave-in, while not dangerous to anyone ( everyone was outside ), was fatal to the project. Maybe 200 - 400 tons of material dropped, covering the work area. Thank god, no one was hurt. We have inspected all parts of the underground and the likelihood of more good credit is small to non-existant. I have given up the lease. 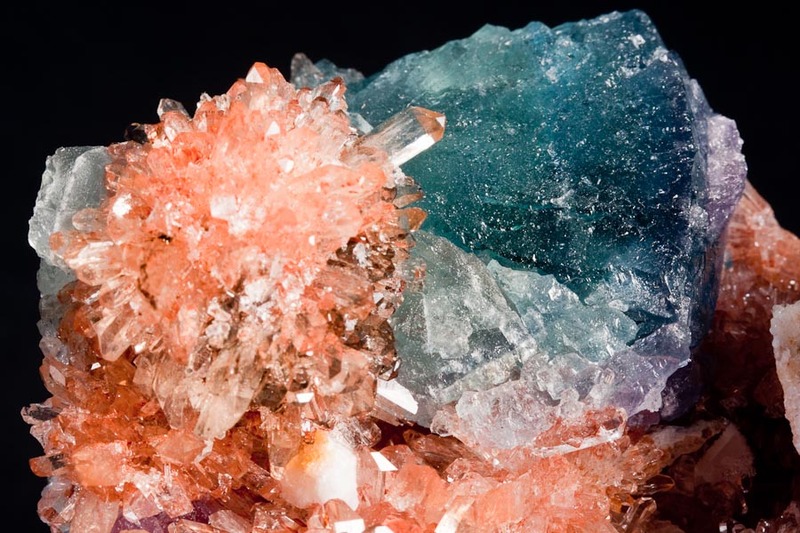 Perhaps because these crystals came from a deeper level of the mine, and were not exposed to weathering, they have better lustre. Also, the crystals from these two new pockets have a generally more intense orange color, and large individual crystal sizes. Using modern equipment for collecting, they were able to also extract more large specimens in good condition. Most people who saw these at Denver agreed with me, that these are certainly among the world's great specimens of the species for beauty and size. As well, they are frankly cheap compared to any creedite you can obtain from any other location which has produced it, usually only in smaller and less visually appealing specimens. Despite the wealth from this mine, overall creedite is a fairly rare species! I recall 25 years ago struggling to find an affordable example for my own collection - they just were not around to be had. 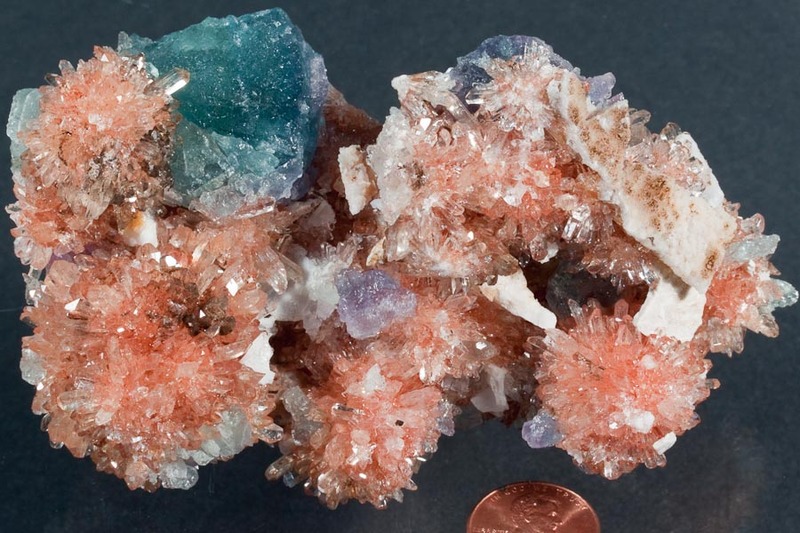 This specimen consists of numerous "star-burst" shaped, burnt orange creedite clusters. Scattered all over the specimen are fluorite xls ranging in color from pale sea foam green to nearly purple, the largest measuring 3.3x2.5cm. There are dinged creedite xls and the fluorite xls appear to be partial xls. Enjoy!